New York: E.P. Dutton, 1919. One quarter black cloth with gilt lettering to spine; green paper to boards with gilt/black decoration to front board. Illustrated throughout with black and white prints. The signatures are unopened. Some wear to the paper along the upper and lower edges. 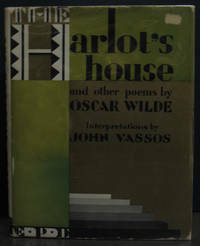 Dustjacket shows wear to the outer edges, and there is an abrasion to the upper right front panel where a price sticker was removed. Signed by Vassos on the half-title in New York City, July 29, 1932.. Signed by Artist. First Edition. Hard Cover. Very Good/Very Good. Illus. by John Vassos. 8vo - over 7¾" - 9¾" tall.